No one knows better than the Virginia Tech Transportation Institute the extent of driving distraction as the cause of crashes. Driving is a visual task and non-driving activities that draw the driver’s eyes away from the roadway (such as texting, dialing, and use of a laptop or dispatching device to perform complex tasks) should always be avoided. Naturalistic driving studies conducted at VTTI have shown that text messaging using a cell phone is associated with the highest risk of all sources of distraction. Text messaging, which is approximately 20 times riskier than driving while not using a phone, also had the longest duration of eyes-off-road time (an average of 4.6 seconds). This equates to a driver traveling the length of a football field at 55 mph without looking at the roadway. The VTTI Driver Distraction in Commercial Vehicle Operations study found that texting while driving raises a driver’s crash risk by 23 times. This statistic has been touted internationally, over 20,000 hits, from the New York Times to the Ad Council to AT&T. Talking on a cell phone or smartphone; however, hands-free does not increase risk. The “23 times” message helped lead U.S. Transportation Secretary Ray LaHood and the U.S. Department of Transportation to issue a call to end distracted driving. To date, 39 states and the District of Columbia have banned text messaging for all drivers. VTTI Director Tom Dingus has appeared before U.S. Congressional Subcommittees to testify about distracted driving. He was also an invited panelist at Secretary LaHood’s Distracted Driving Summit. As a direct result of the Distracted Driving Summit, President Obama’s administration enacted an Executive Order banning all text messaging for four million federal employees while driving government-owned vehicles, while driving any vehicle on official government business, or using mobile devices issued by the government while behind the wheel. Using VTTI naturalistic data, the Federal Motor Carrier Safety Administration (FMCSA) and Pipeline and Hazardous Materials Safety Administration (PHMSA) enacted a ban effective January 2012 on hand-held cellular phone use among truck and bus drivers. 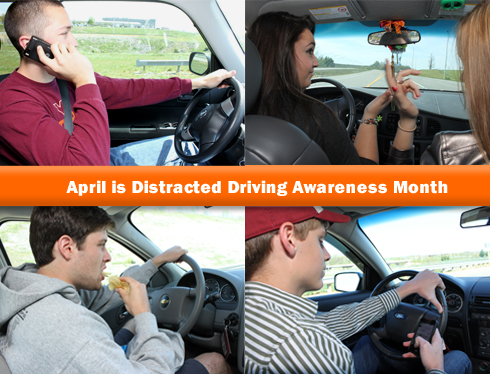 Much of the research conducted at VTTI focuses on the causes and prevention of distracted driving. Analyses made using the original 100-car Naturalistic Driving Study continues to provide valuable information. Data collection is nearly complete on Strategic Highway Research Program (SHRP 2), an even larger naturalistic driving research program that involves 2,000 cars. The Teen Risk and Injury Prevention (TRIP) group at VTTI is also currently developing a teen driving program that provides real-time monitoring, immediate feedback to the teen driver, and post-trip feedback to the teen’s guardians via the VTTI DAS. As a result of their distraction research, researchers with the TRIP group have been featured on the Discovery Channel, 20/20, and 60 Minutes Australia. We want to thank all of the VTTI researchers, including students, for their years of work to create and analyze the 100-Car Naturalistic Driving Study and for communicating the results worldwide. Also, thank you to all participants and sponsors involved in our critical research and to the National Safety Council for this month-long educational program. Inattention-related relative crash/near crash risk estimates (odds ratio 0-2). Inattention-related relative crash/near crash risk estimates (odds ratio 2-4). Inattention-related relative crash/near crash risk estimates (odds ratio 4-6). Inattention-related relative crash/near crash risk estimates (odds ratio greater than 6).